Based on the amazing toning and re-contouring effects of Original Tonus B12 with a hint of potent green tea and concentrated vitamin B12, with a Self Tanning element! A safe, quick and effective way to shape the body and tone while generating a beautiful, natural looking healthy tan, all at the same time. No parabens and completely preservative free, this new product is already in high demand. Used in association with our oxygen therapy in Silhouette, Tone and Tan will provide a really healthy looking glowing tan that is both beautiful and safe. Oxygen revives ad energizes like nothing else and really brings the skin to life as well as detoxing, hydrating and healing the skin. The tan achieved will not only look more realistic and natural but will be vibrant and fresh not to mention healthier and safer. 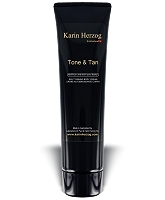 Tone and tan is based on our ever popular 'Tonus B12' but with the added benefit of a self tanning agent. Tone and tan is a very safe and natural product designed to work along side your existing Herzog products to deliver a beautiful, natural looking tan. Did you know that if the body has too many toxins than the liver can cope with, it lays down more fat to wrap around the toxins in an effort to HIDE them. If left unattended these can present a potential health hazard. Our Dynamic Duo kit has a double approach:- B12 to search out and convert these fat cells to energy leaving toxins exposed waiting for the Oxygen in the Silhouette to blast them away creating a much healthier environment and a smoother, more toned outer skin. Increasing Oxygen levels has been proven to help the body increase its own natural production of stem cells to help promote healing. Massage Tone & Tan onto the area using deep and sweeping movements until fully absorbed. Please note a little goes a long way so use sparingly. IngredientsWater, Mineral Oil, Glycerin, Sorbitan Palmitate , Sesame Oil, Alcohol Denat., Dihydroxyacetone, Avocado Oil, Jasmine, Green Tea, Sodium Metabisulfite, Vitamin E, Citric Acid, Salicylic Acid, Vitamin B12, Magnesium Stearate.